MTN-Qhubeka can celebrate another successful Grand Tour after their Italian sprinter Kristian Sbaragli took victory ahead of Giant-Alpecin’s John Degenkolb on stage 10 of the Vuelta a España. In what was a chaotic sprint, with most of the teams’ lead out trains destroyed by the category two climb 16 or so kilometres from the finish, Giant appeared to be the team with the most cohesion as they held things together for a sprint finish for their man Degenkolb. Even race leader Tom Dumoulin, who wears the red jersey after his stage win on Sunday’s stage, helped chase down breakaway riders to set things up for the Paris-Roubaix winner. But Degenkolb found himself boxed as the riders battled it out in the final kilometre into Castellon, with Sbaragli narrowly holding on to take his first Grand Tour stage ahead Degenkolb and Movistar’s sprinter JJ Rojas. The 146.6km stage profile from Valencia had looked to lend itself to a breakaway, and there was no shortage of action out front as a group of 40 riders attempted to get up the rode. But the GC teams didn’t seem keen on letting anyone get away, with Movistar and Giant working hardest in support of their sprinters and their overall favourites to keep everything together. Niki Terpstra (Etixx – Quick-Step) made a solo dig 46km from home in vain, while Kenny Elissonde (FDJ), Alessandro Di Marchi (BMC) and Romain Sicard (Europcar) got away on the final climb but were caught quickly after the descent as the reduced peloton pulled them back to set-up a sprint finish. 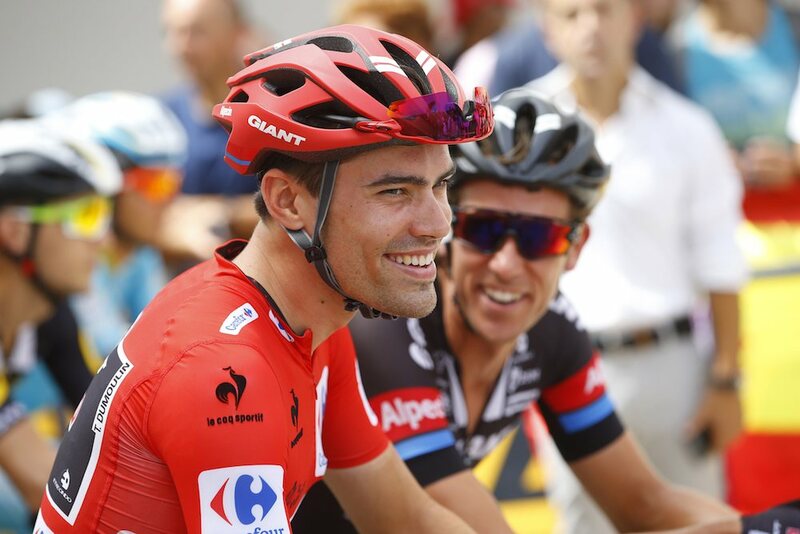 It means there was no change in the top-10 as the Vuelta heads into its first rest day, with Dumoulin maintaining his 57 seconds lead over second place Joaquim Rodriguez (Katusha). Team Sky’s Nicolas Roche had the most eventful day of the contenders, crashing on a roundabout and suffering a mechanical, but he also held his place in the overall after riding back on to the lead group.